As a restaurant owner, you may feel completely overwhelmed when thinking about a social media marketing strategy. After all, you are in charge of the day to day operations of running your restaurant, including hiring and firing, food orders, cooking, bookkeeping, maintenance and other responsibilities. Now add marketing to your list of job duties. But here’s the thing: social media is not going away. It is going to become even more important for businesses in the future. Think about it: people don’t use the yellow pages to look up information — they Google it. Pretty soon there will be no generation divide between internet users and non-internet users. It will just be a way of life. While traditional advertising methods still work, now is the time to start getting really comfortable marketing your restaurant online and leveraging the power of social media to grow your business. A classic beginner mistake when planning a social media business strategy is thinking that you have to be everywhere at all at once. This means setting up accounts on Facebook, Twitter, Pinterest, Youtube, LinkedIn, Instagram, Snapchat, etc. The truth is, you should use one or two of your favorite social media platforms (ones that you are already using) to focus your efforts. If you don’t have a favorite social media site, start with Facebook since it is still the most popular social media site across all demographics. Remember the 1980s sitcom Cheers based on the Boston bar where ‘everybody knows your name’ ? People liked the show because they felt like they knew Sam and Woody, Cliff and Norm, Diane and Carla. Even if they had never set foot in the actual Cheers restaurant in Boston, viewers of the show felt like they knew the bar well. Building a strong personal brand on social media can have that same effect for your restaurant. Showing people your restaurant’s personal side—the faces behind the menu, the people cooking the meals, the story behind certain dinner specials, the charity giving to local youth teams or fundraisers—reminds people that your restaurant is more than just a place to eat. It’s a great place to hang out, it’s interesting, fun, the perfect place to gather for special occasions or just grab a drink after work. Decide how you want your restaurant to be perceived and then start cultivating that image online as well as in your restaurant. Social media is all about sharing. You want customers to connect with your restaurant by sharing specific information with them. This could be photos of your menu items, your staff having fun at work, recipes, video tours of your dining room, funny restaurant memes. Sharing more personal information, like your bartenders' favorite cocktail or your servers' favorite dessert, offers a sense of inclusion for customers. They’ll feel like they know your staff better and — by extension — your restaurant. Curate is the newest buzzword for marketing — it essentially means gathering and organizing information in one place. 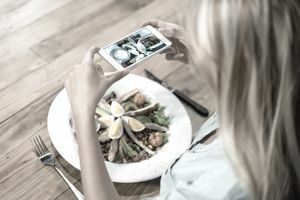 The simplest example of curating content for a restaurant social media plan is taking lots of photos of your menu items. Ask your kitchen staff to snap photos as they prepare food (obviously, don’t do this during the Friday night dinner rush) and send them to you. Pick out the best photos and store them in a central place like Google Drive or Dropbox. You easily share the photos on Facebook or Instagram any time, without having to stop everything to take a new picture. Other curated content ideas are recipes — especially when they’re accompanied by a good quality photo, photos of customers having a fun (ask their permission first), holiday photos from the year before — this is a good way to market your restaurant for catering or event hosting. There is a general belief that if you don’t post social media content consistently to your accounts, you shouldn’t post at all. In other words, sporadic posting is worse than no posting. Consistent posting is key to a successful social media strategy. It will keep your restaurant. It will serve as a reminder to customers to stop by for a beer during happy hour, or that Tuesdays is 2-for-1 dinner specials. Social media sites are busy places. You need to show up often in order to stand out from the crowd. Facebook: One to two times a day between 1 p.m. and 4 p.m.
Twitter: Five times a day between 1 p.m. and 3 p.m. on weekdays. Same goes for lunch, here as well. Twitter is the neediest social media platform, so if you are trying to minimize the amount of time you spend on your social media plan, you may want to skip it altogether. Instagram: Once a day is good. Twice won’t hurt. Any more than that and you run the risk of being annoying. Pinterest: Four to 10 times a day with weekends being the best time to post. Sites like Hootsuite offer a free scheduling tool, so you can create posts weeks or months in advance. This is good for big events like Valentine’s Day and Mother’s Day. However, since many of your posts will feature daily lunch specials and dinner specials, posting organically (not scheduling it) every day may work better. It will only take a few minutes if you have the aforementioned curated content ready and waiting. Social media isn’t hard, but it does require organization. Once you have your curated content ready, creating daily posts will only take a few minutes.